Over a hundred and fifty years ago, the Indigenous Apsaalooke, or Crow, peoples’ way of life completely collapsed with the onslaught of white settlers in the west, the disappearance of the buffalo, and the creation of Native American reservations. It was the end of the world as they knew it. In that void, Chief Plenty Coups, a renowned Crow leader, said, “After that, nothing happened.” Although the Crow went on living, albeit in the starkest of ways, their lives held no meaning and their actions served no purpose. A week later, I submit an Opening Brief to the Tucson Immigration Court. Sixty pages of facts and legal arguments that form the basis of your request for asylum. I concurrently file over five-hundred pages of supporting documents including expert witness reports and country conditions documents to prove your claims, and a cornucopia of motions requesting court translators, the use of telephonic testimony, and amendments to forms you submitted before you had an attorney. Experienced asylum lawyers say opposing counsel won’t bother to read my filing. The judge, they say, may or may not read the whole thing but won’t like the length of the brief, which ideally should be half what it is but can’t be given the complexities of asylum law and the multiple layers of arguments that must be made. Human stories have burrowed into the dark spaces where micro-cilia-hairs sweep the world’s symphony in and out of my ears. Or rather, their pain is writhing there, embedded in invisible liminal spaces. The daily horrors revealed in the headlines and blogs and news and podcasts that saturate us. My cells grasp to make sense of tesseracts that collide far-flung realities, light-years converging into single points of intersection. The history of the Crow and Chief Plenty Coups is recounted by philosopher Jonathan Lear in the book, Radical Hope: Ethics in the Face of Cultural Devastation, as a case study in human vulnerability. Not the frailty that comes from aging or injury or death, but the sense of annihilation that follows the collapse of a world. Lear examines whether it’s possible to continue inhabiting life when life as one knows it stops. In other words, what happens when “after this, nothing happened”? Days later, I receive a hefty package from the Office of ICE District Counsel containing no brief, no legal argument, no motions. Just pages and pages of country conditions documents ostensibly showing that your country is now safe for you to return to. There’s also a transcript of your interview with a customs and border patrol officer when you arrived at the Mariposa Port of Entry. They asked you, as they do to everyone, whether you intended to work here so later they could argue you came here for economic reasons. Scientists just “discovered” a new organ — they’re calling it the Interstitium. They say it’s the largest organ in the human body that went undetected all these years. They don’t know what it does but think it’s a fluid-filled network residing in the connective tissue that links everything inside us — organs, muscles, skin-like a matrix. It exists in-between all the other places. I was introduced to it years ago when I was nine months pregnant with my second child, scared and in pain. My midwife sent me to see an ordinary-looking physical therapist who turned out to be a three-hundred-year-old healer. She taught me about the myofascia and told me that western medicine has found it stores proteins borne from trauma — ours, as well as others. I’ve since learned techniques to unwind the twisting—which can result from physical and emotional pain—that has been scientifically measured as the exertion of two-thousand pounds of pressure per square inch. That’s the equivalent of an elephant standing on your nerves, joints, blood vessels, organs, and other bodily structures that happen to be in the way. 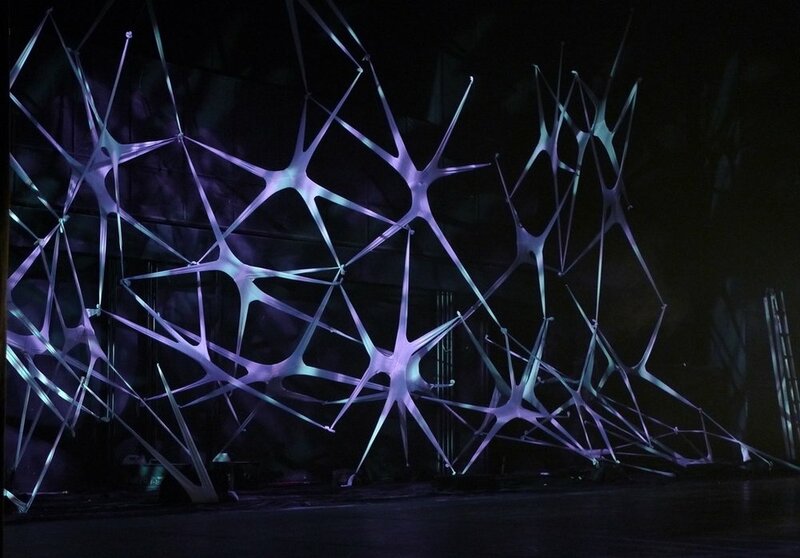 Saskia Jorda, "Walks of Life," Site-specific installation at the Haidian Theater in Beijing, China. Collaborative project with Fashion Designer Galina Mihaleva and Choreographer Shouze Ma / Stretched pantyhose and string, 2009. When he was young, Chief Plenty Coups had a dream-vision in which he became convinced that the Crow way of life was about to end in catastrophe and that the only way for the Crow to endure beyond mere biological survival was to embrace the idea of a radically different future that they could not, as of yet, imagine. Lear believes this level of commitment “that something good will emerge” is impressive because one cannot, from this vantage point, even glimpse what that good might look like. You’ve said repeatedly that you came to the U.S. seeking asylum but told the border officer you would also look for work here because you’ve always worked and didn’t want to be a burden to this country. Sometimes the pressure in my inner ear feels like cotton balls, other times it is a dampening, deafening roar. Often, but not always, it vacillates between my left and right ears. The torture you endured combines with refugee children separated from their parents, and pregnant girls in detention facilities denied access to abortion even when they were raped. The doctor assures me that the hearing loss is only in my left ear, that whatever sensations I’m having in the right ear are my brain trying to compensate. I’m fairly certain he doesn’t know about the interstitium so I don’t tell him that I think it’s my myofascia unraveling, trying to heal. Chief Plenty Coups’ commitment to some good happening at some point for the people who used to find meaning as Crow was not the naive idea that history moves in a beneficial direction or that progress is inevitable. He lived through the devastation of his people and acknowledged the abyss that lay ahead. He knew he could not know what survival meant, and still he believed the Crow would prevail. This, says Lear, constitutes radical hope. I will also prepare our expert witnesses for their testimony. For example, I’ve asked our psychologist if she can help the court understand why you didn’t provide details of the persecution you suffered in your border interview that first day you stepped onto U.S. soil. In response, she’s told me that victims of trauma, especially those who’ve suffered as severely as you have, find it difficult to speak about these matters with strangers who often are men in positions of authority like the customs and border patrol agents who interviewed you. I tell my guide that it is very dark in here, that I am terrified. She says in a voice barely above a whisper, “shine your light on it, ask it what it needs, be curious.” A miniature version of myself stands inside my body, at the site of the injury, holding a flashlight. What I see is thorny and bristly, a teratoma of teeth and claws and hair. I want to run and hide, get as far away as possible, but instead touch its tender raw flesh. According to Lear, Chief Plenty Coups’ hope was a remarkable human accomplishment because it avoided despair even if it wasn’t justified, even though it didn’t restore the Crow to their former state. I will ask our physician expert, the one who examined you, to describe in detail the scars, wounds and marks that were inflicted all over your body by your persecutors. I know this will be hard for you, I’m sorry, it’s okay if you cry. I text my guide that I’ve been unwinding, releasing, meditating, even had acupuncture for the the first time, and still my ear’s not fixed. What more can I do? Lear remarks that Chief Plenty Coups’ form of hopefulness was peculiar in that the chief acknowledged that the hope he held was not yet intelligible, even to himself. In a few weeks, we will sit side-by-side, you and I, in front of the judge and across the aisle from the government’s lawyer. I will deliver my opening statement, I will call you and the expert witnesses to the stand to testify, I will object to opposing counsel’s irrelevant questions, I will give an impassioned closing argument. Throughout, inside my ears, there will be an ocean swell. A reminder of inconceivable hope. It will be small but fierce. Just like you. This is the final essay in Shefali Desai's ongoing series, Asylum. Shefali Desai is a child of the Sonoran Desert, daughter of Indian immigrants, mother of sons, lover of the earth, and a fighter/writer/lawyer. She has been a Rhodes Scholarship finalist, Arizona Supreme Court law clerk, and VONA fellow. Her book-length manuscript was selected by Lidia Yuknavitch as a finalist in the 2016 Kore Press Memoir Competition, and her work has been published widely including in Ms. Magazine, the UCLA Women’s Law Journal, Kartika Review, and the anthology This Bridge We Call Home. Shefali currently is co-authoring a legal paper on federal and state regulatory power over so-called sanctuary cities, litigating an asylum case, and finalizing a hybrid memoir. Her six-part series for Corporeal Clamor titled “ASYLUM” is a blended legal/personal/lyric essay that layers the law with lived experience. Shefali lives in the painted hills of Tucson with her partner and two sons. Newer PostS1:E5 "You know how I feel"